Well done to everyone who litter picked on Saturday 30th March around Roslin. A big thank you for a big turnout! We had over 40 adults and 30 kids filling 47 bags of rubbish and a trailer as well (too much to count). In 2018 we had 32 people pick up 34 bags of rubbish so we’ve smashed that, thank you all! Hot spots seem to the railway path, wooded walks, behind bus stops and the main roads. I hope you enjoyed the wander around our beautiful village, a chat with friends and a play in the park. 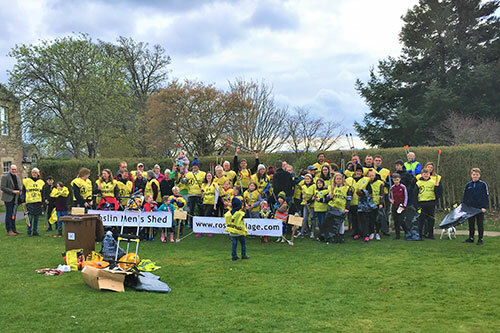 The Roslin Men’s Shed helped organise the morning and we all had a great time. We have made our own litter pick signs and, along with a few cones, we tried to keep the road pickers as safe as possible. Shellie Radford (Waste Aware Education Officer) at Midlothian Council was great, dropped off 30 litter grabbers and loads of bags for us to fill. We had lots of support from volunteers and local businesses with food and drink to recharge the batteries afterwards! 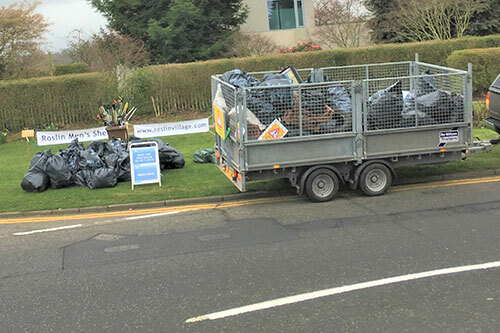 The Midlothian Council litter team helped pick up the bags after our event.